Do you want to be a part of next year's Healthcare Design Conference? Submit your presentation proposal for educational sessions and roundtable discussions. Presentation proposal submission deadline for Healthcare Design 2015 is Friday, January 30, 2015! If you don't pass, retake the exam once at no charge. *This offer is for new EDAC exam registrants only. Certification must be completed within one year of registration, (candidates are restricted to two retakes and a 60-day waiting period between exams). Free retake applies only to the second exam. Questions? Contact Shannon Roecklein at sroecklein@healthdesign.org. Ending Next Friday, January 16! 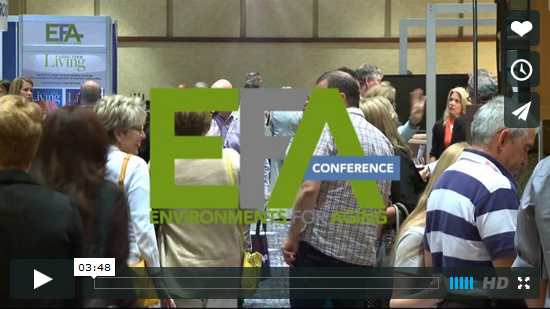 Environments for Aging offers attendees the opportunity to learn the latest innovations and best practices in the design of long-term and residential care settings. Don't miss your opportunity to gain inspiration through a gathering of like-minded, forward-thinking individuals instrumental in the creation of future living environments for the aging. The next regional Healthcare Design Academy providing educational sessions and resource connections for architects and facility administrators, is February 26-27, 2015 in Washington DC. More information here. Did you know that 73% of 2014 Healthcare Design conference attendees were looking for new products and services and that 74% were final decision makers? Want to be a conference exhibitor or sponsor? Download the HCD 2015 sponsorship and exhibit opportunities here. A must-have EBD resource, Jain Malkin's lively writing style makes research read like an adventure story with fascinating discoveries at every turn. Learn more here. Need More CEUs? Affiliate members now receive a FREE annual digital subscription to Research Design Connections with a database of more than 1,800 articles. Learn more about the benefits of membership, here.